Wide open spaces, dark starry skies and a vast stretch of sandy coastline that's dotted with nature reserves and bird sanctuaries; Lincolnshire is a boon for lovers of the great outdoors. This beautiful easterly county, home to historic Lincoln and the rolling Lincolnshire Wolds, has fast become one of the leading locations in the UK for glamping. 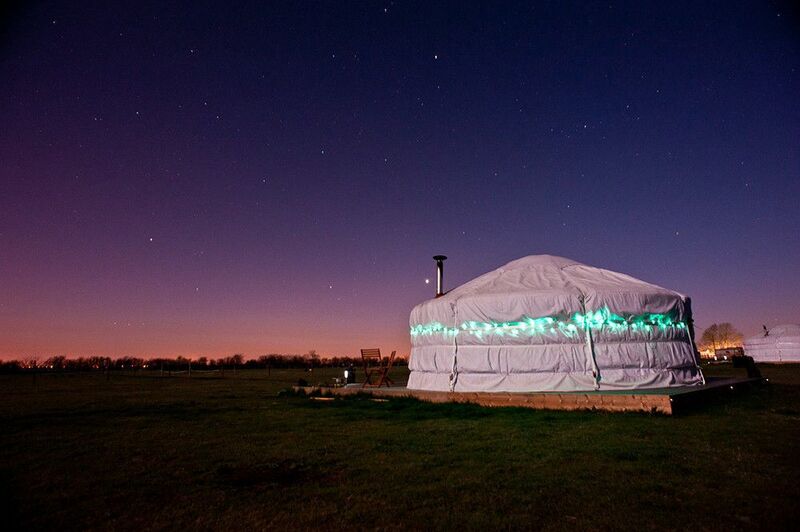 From super-luxury yurts with grand pianos inside and four poster beds, to secluded shepherd's hut hideaways and traditional gypsy wagons, there's something in Lincolnshire for everyone. Expansive Lincolnshire, with its long, beachy coastline backed by the Lincolnshire Wolds, is an often underrated glamping destination. Although some of its seaside resorts have been attracting people on holiday for decades, its reputation is more for large-scale holiday parks by the beach than charming glamping getaways. But delve a little deeper and step away from the row-upon-row of caravans and chalets on the crowded sections of coast and you’ll find that there are plenty of great glamping sites with dozens of attractions on their doorstep. It doesn’t matter what sort of holiday you favour, one of the big attractions of Lincolnshire as a holiday destination remains the same – those beautiful, long sandy beaches. There’s plenty of traditional seaside fun and frivolity in the larger resorts of Skegness and Mablethorpe but away from the built-up areas it’s still possible to get lost among the dunes and discover a wilder, more natural Lincolnshire coast too. Inland Lincolnshire has no less charm with the beautiful but contrasting Wolds, Fens and Vales. Unspoilt countryside, charming villages and a fascinating history make Lincolnshire a great holiday destination however you choose to visit but camping and glamping really help you appreciate the natural side of this east England county. Bell tents, tipis, yurts, safari tents and shepherd’s huts – we’ve seen them all and brought together a collection of only the very best. Browse our picks of the top glamping sites in Lincolnshire below and book your next glamping holiday online today. You might say that Lincolnshire was the natural home of glamping as it was here, in Skegness, that the first Butlins Holiday Camp opened in 1936 offering people the chance to stay in chalets on the coast. While we are fully on board with the idea of chalets in a seaside location, the glamping sites we favour tend to be a little smaller and a whole lot quieter. Holiday camps keep you occupied with discos and cabarets while the glamping sites in Lincolnshire that we list are more likely to feature campfires and stargazing by way of entertainment. And while a holiday camp is designed to offer everything you need for a holiday within the park or resort, our glamping sites are places from where you can go out to explore the local area. 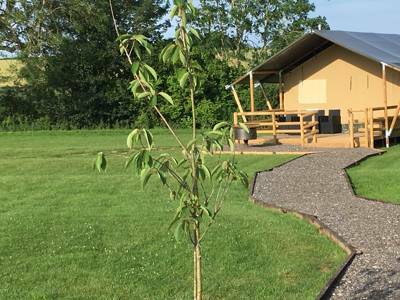 If that sounds like your kind of holiday then glamping in Lincolnshire should be right up your street. The tough part will be choosing which glamping site to go to. 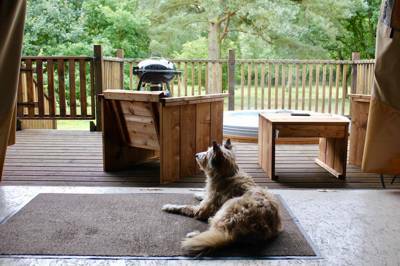 There are woodland glamping sites, meadow glamping sites and glamping sites on farms. There are family-friendly sites where a few bell tents, tipis or yurts are clustered together and there are sites that are perfect for romantic retreats with a shepherd’s hut or vintage caravan in a secluded spot. Seasoned glampers may have an idea of the type of glamping getaway they prefer, be it a simple bell tent or an elaborate treehouse, but if you are new to glamping the choice can be overwhelming. These days glamping sites have catered for every whim and fancy so amid the tipis, yurts and safari tents, shepherd’s huts, gypsy caravans, log cabins and pods you are likely to find something that takes your fancy. But how to choose? Let us help! If you are planning a glamping holiday for the summer when the weather is warmer and (fingers crossed) drier, the canvas or cotton cover provided by a bell tent, tipi, yurt or safari tent can be just right. You’ll feel infinitely more connected to the outdoors and it is closer to classic camping too. If you opt for tented accommodation in the cooler months you may want to select somewhere with a wood-burning stove to keep things cosy. And larger families or groups may prefer the greater space provided by a safari tent which can often have separated sleeping areas. If canvas is a little too close to roughing it, how about a shepherd’s hut, vintage caravan, cabin or pod? And there’s plenty of quirky glamping options including converted vehicles and modern geodesic domes too. To make sure you find somewhere that meets your needs use our “Refine Search” feature. Glamping can provide the ideal solution for families who are split in their love of camping. If the kids love camping but you can’t bear the thought of sleeping on a roll mat or air bed, glamping keeps everyone happy. You get a comfortable bed and the kids get to stay on a camping or glamping site where they can make friends and spend time outside. Shepherd’s huts, gypsy caravans and the like might as well have been built for kids with cosy cabin beds, clever hideaways and pint-sized accessories. Going off grid on a camping or glamping holiday can provide a great time for the family to enjoy a bit of a digital detox and reconnect with board games and simple pleasures like cooking outside and sitting around the campfire. There’s plenty of great family glamping in Lincolnshire and you can choose from sites where there are activities to keep the kids occupied and sites on farms where children will have the opportunity to see farm animals daily. Family-friendly attractions for days out in Lincolnshire are also plentiful from days on the beach and fun fair rides at seaside theme parks to adventure playgrounds at historic houses and farm parks where you can meet the animals. Candles, stargazing and snuggling up under blankets… glamping is effortlessly romantic. Its charm is surely enough to melt the stoniest of hearts. Who could resist a cosy shepherd’s hut, a yurt with a skylight so you can watch the stars as you drift off to sleep or a vintage caravan where you can play board games and share a bottle of wine? When it comes to romantic glamping in Lincolnshire, it’s not hard to find the perfect pad to share with a partner. Where you choose will depend on your idea of romance. Do you prefer to be away from it all in among the natural world or would you and your partner prefer the luxury of a hotel room from your glamping getaway? With today’s range of glamping sites anything is possible from basic cabins to places with private hot tubs. Days out walking on windswept beaches, along peaceful waterways or discovering the charming market towns of Lincolnshire can be finished off with the romance of campfires and candlelit dinners. The bright lights of Lincolnshire’s seaside resorts attract holiday makers from across the Midlands, Yorkshire and further afield. For kiss-me-quick entertainment, arcades, fun fairs, fish and chips and buckets and spades head for Skegness or the golden sands of Mablethorpe. To walk along a pier with ice-cream in hand, head north to the equally well-developed town of Cleethorpes but when the arcades have swallowed your last pennies, you can still find some less developed areas of coastline. Not far south of Skegness, is Gibraltar Point Nature Reserve where a colony of common seals are resident along with a wide range of birds. Another nature reserve, further north, is the pleasingly named Saltfleetby – Theddlethorpe Dunes. Here, 95 acres of mudflats, sand dunes, and marshes make up a wilder stretch of coastline that provides an important habitat for wildlife and a great place to escape the crowds. We discovering glamping sites within walking distance of the beach and, across the UK, we've searched for the best seaside glamping sites. Alas, many sites in Lincolnshire are located close to the sea but not quite within touching distance, with many locations set just back from the coast and enjoying the quieter setting of the Wolds. Whatever you're after, though, we're sure to have something to suit in our collection. Much is made of the Lincolnshire coast but the Lincolnshire Wolds are equally worth exploring. This Area of Outstanding Natural Beauty in north Lincolnshire features some of the most unspoilt countryside of the East Midlands and the highest point between Kent and Yorkshire. The Wolds are affectionately known as Tennyson Country as it was in this part of the county that the well-loved poet was born and lived for part of his life. Unlike the rest of this relatively flat county, the Wolds are characterised by rolling chalk hills with hidden valleys, gentle streams and charming villages in between. It’s classic walking country so if your idea of a good holiday involves a bit of a hike, look out for glamping in or near the Lincolnshire Wolds and don’t forget your walking boots! There’s good walking down on the Lincolnshire Fens too. Part of east England’s flat coastal plain around The Wash, the Lincolnshire Fens are a fertile area of low-lying countryside that’s criss-crossed with waterways and mostly used for farming. Dozens of pathways and bridleways make this area, bordered by Norfolk and Cambridgeshire, a perfect place for easy walking, cycling, running and wildlife watching. Lincolnshire south is the area known as the Vales where you’ll find picturesque market towns, including Stamford where there are hundreds of listed limestone buildings that will have you reaching for the camera. The area’s many grand houses and stately homes can also make for good days out while glamping in Lincolnshire. You can find out about things to do in Lincolnshire at one of the county’s Tourist Information Centres and there’s plenty of information on the Visit Lincolnshire website too. But we’ve put together our own list of the county’s highlights – a few suggestions of things you won’t want to miss while you’re glamping in Lincolnshire. 1. Explore The Wolds – Tennyson Country. Immerse yourself in this Area of Outstanding Natural Beauty, the place that the well-loved poet Alfred Tennyson called home, as you enjoy walks and picnics among rolling chalk hills and flower-filled meadows. Get your bucket and spade out and head for the golden sands of Mablethorpe. One of the Lincolnshire coast’s best-loved beaches, Mablethorpe makes the most of its golden sands with traditional attractions including donkey rides that your kids will love. 3. Ride the merry-go-rounds at Skegness Pleasure Beach. A visit to one of the original English seaside resorts is a must when you’re in this part of the world. Skegness has been welcoming campers to its holiday parks for generations and it has the entertainment to prove it! 4. Take a stroll on the pier at Cleethorpes. Another family-friendly beach with lots of facilities, Cleethorpes is a great place for traditional fun but it’s also renowned as a bit of a kite-surfing Mecca so if you prefer activities with a bit more action, consider glamping near Cleethorpes. 5. Explore Gibraltar Point Nature Reserve. When you’ve had enough of the thrills and spills of the seaside amusements, this nature reserve is a great place to experience the other side of Lincolnshire’s coast – the wilder one. Start at the visitor centre and follow a trail around the dunes, grassland and marshland to spot birds and other wildlife. 6. Look out for seals at Donna Nook Nature Reserve. All weather glampers only need apply! Lincolnshire’s grey seal colony spends most of the year on distant sandbanks but come to this protected stretch of coastline to give birth between October and December. A great place to see this spectacle if you are on a winter glamping holiday in Lincolnshire. If you get close to the city it’s pretty hard to miss Lincoln Cathedral. It’s colossal and once held the honour of being the tallest building in the world. Climb its tower for amazing views of the city and beyond. It’s said to be one of Europe’s finest examples of Gothic architecture too so if you head into the city it’s worth taking a look. 8. Admire the Georgian splendour of Stamford. You may feel like you’ve stepped back in time if you take a visit to Stamford where there are more than 600 listed buildings. Full of independent shops and genteel tearooms – where you can tuck into a slice of Lincolnshire speciality, Plum Bread. 9. Take a tour of Burghley House. Billing itself as England’s greatest Elizabethan house, Burghley is certainly impressive and its gardens and parkland are vast. Forget the school-trip feel of yesteryear though, your kids will be enthralled by the Horrible Histories-style tours that are usually laid on in the summer holidays. 10. Chuck a Lincolnshire sausage on the BBQ. Cooking on the barbecue or over a campfire and eating al fresco is all part of the fun of a glamping or camping holiday. And when you are glamping in Lincolnshire there’s only one type of banger you should consider – the sage flecked, Lincolnshire variety. Delicious! Glamping sites in Lincolnshire, Lincolnshire glampsites at Glamping in Lincolnshire, Glamp in style in Lincolnshire at one of Cool Camping’s handpicked glamping sites, ranging from luxury safari tents to lotus belle tents, romantic retreats to scenic glamping spots, child-friendly sites to group-friendly glamping - there’s a site for all tastes.